Summer is near, which means we’re about to buy more seasonal fruit, such as watermelons, peaches, and strawberries. But you might want to hold off the strawberry shopping, as the little red berries continue to top the Dirty Dozen list of the Environmental Working Group. According to the EWG Shopper’s Guide to Pesticides in Produce, strawberries and spinach too the first and second place in the 2017 line-up of commonly grown produce with the highest levels of pesticide residues. 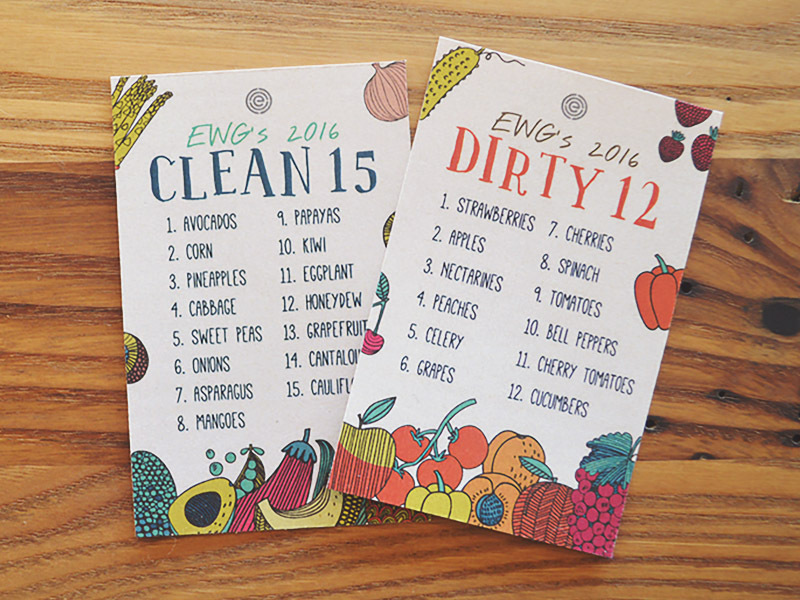 Since 2004, EWG – a consumer health watchdog – has published its annual Shopper’s Guide to Pesticides in Produce. The ominous list ranks the 48 of the most conventionally consumed fruits and veggies, their pesticide contamination and the total pesticide contents. The U.S. Department of Agriculture and Food and Drug Administration has tested over 35,200 samples of conventionally grown produce. EWG has based its research on these very tests, and the results are worrying to say the least. The samples weren’t tested directly from the farmland; first they were readied for consuming. It means they were carefully washed (and peeled, when needed). Let’s see some of the findings and how they should affect your everyday produce shopping. The food production industry uses pesticides extensively to curb pests, including rodents, insects, bacteria, fungus, and weeds. In addition to agriculture uses, pesticides also protect public health by keeping organisms that carry tropical diseases under control, such as mosquitoes. But according to the World Health Organization (WHO), pesticides also represent a toxicity risk to humans. Over the years, WHO researchers have studied their adverse effects on nervous or immune systems as well as reproduction. Various findings show pesticides could cause other health problems, including cancer. And it’s not at all reassuring that fruits and veggies can contain pesticide traces even after they’ve been properly washed and peeled. Meanwhile, a 2014 report by the USDA revealed that, “overall pesticide chemical residues on foods tested were at levels below the tolerances established by the Environmental Protection Agency.” In other words, pesticides do not qualify as a consumer safety concern. Based on the analyses, the EWG reported that almost 70 percent of samples of the 48 types of common produce presented contamination traces of at least one pesticide. That figure is down 6.6 percentage points from 2016. At the same time, USDA researchers analyzed thousands of produce samples and found no less than 178 distinct pesticides and pesticide by-products. The average American eats around 8 pounds of strawberries each year. According to the Environmental Working Group, even when washed directly in the field and rinsed once again before eating, the peril is still not avoided. The delicious berries are still most likely to be contaminated with pesticide residue. Spinach ranked eighth on the EWG’s 2016 list. However, thanks to the most recent figures from the USDA, non-organic spinach jumped up a few places. Results showed a sudden increase in pesticide traces on spinach since the non-organic crops were last tested 8 years ago. The residues come from various fungicides and insecticides, including one called permethrin. This insecticide causes seizures and tremors in animals and insects. At least one pesticide residue was found in almost every sample of peaches, strawberries, apples, spinach, nectarines, and cherries. The newest inclusions to the Dirty Dozen list were potatoes and pears and, which replaced cucumbers and cherry tomatoes from 2016. The strawberry sample that ranked as the most contaminated tested positive for 20 distinctive pesticides. On average, spinach samples had twice as much pesticide residue by weight compared to all of the crops tested. At the same time ¾ of all the spinach samples presented residues of a neurotoxic pesticide that European health authorities have banned for food crop usage. Recent studies have associated this dangerous substance with a class of pesticides that causes behavioral disorders in children. It’s rather discouraging to see how much of the produce we eat is contaminated. But there’s something you can do about it. What makes the Dirty Dozen List so useful is the fact that consumers can use it to strategize their shopping. You might not manage to buy organic only, but at least you know which non-organic fruit and veggies to stay away from. If you can buy just one organic item, choose one that ranked high on the Dirty Dozen list and then purchase commonly grown produce from the Clean Fifteen list (see more about it below). “If you don’t want to feed your family food contaminated with pesticides, the EWG Shopper’s Guide helps you make smart choices, whether you’re buying conventional or organic produce,” said Sonya Lunder, an EWG senior analyst. It is absolutely essential to eat fruits and veggies, regardless of the method used for growing them. However, analysts urge people to buy organic when it comes to the produce with the highest pesticide content. If organic is not an option for you, check out the EWG Shopper’s Guide, which will give you recommendations and steer you in the right direction. For the past few years, organic food has seen significant spikes in sales. The stats prove consumers are more likely to buy fruits and veggies grown sans toxic pesticides. The demand has already caused farmers in the food production industry to change their practices and become more sustainable. However, it’s almost impossible to follow a strictly organic diet, so EWG Shopper’s Guide can help people choose from a combination of common and organic produce. For more details and useful tips, visit EWG’s website.